Let’s be honest, my cookie game has never been the strongest. 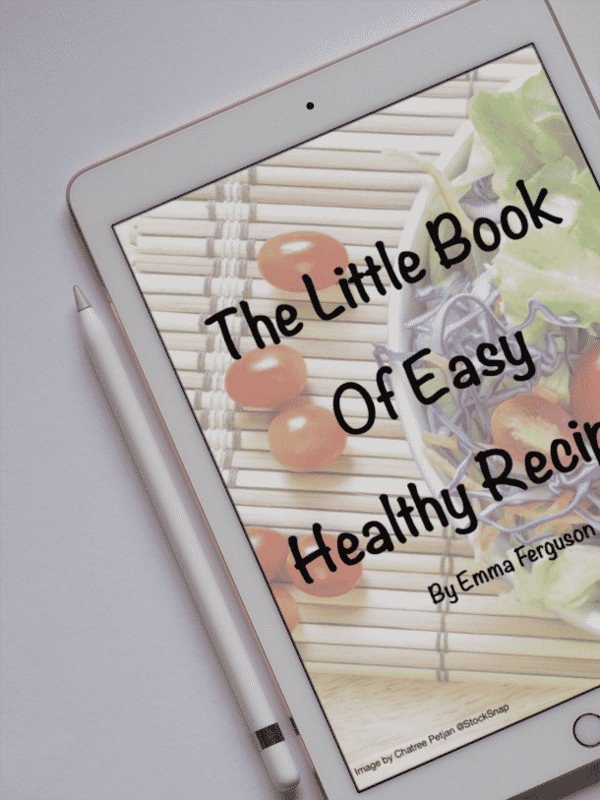 I have my moments and some great recipes that I make time and time again. But I am no cookie master, but behind the scenes, I have worked relentlessly to try and improve. Michael is a cookie fan so I always know when I have hit the right point because he devours them. 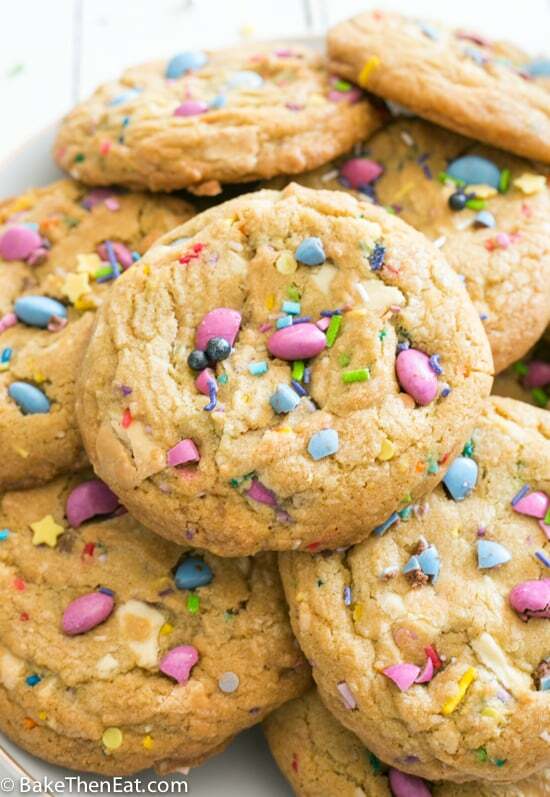 And these Unicorn Sprinkle White Chocolate Chip Cookies hit the bullseye. Okay, it took quite a few attempts, but this final recipe is cookie gold! These cookies are a bakery style lovers dream. Soft in the middle and a little crispy around the edges and packed full of inclusions. 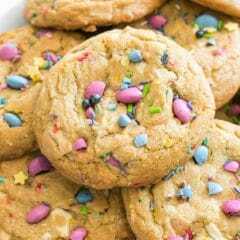 And as an added bonus these cookies keep really well, in an airtight tin you will still be able to enjoy these cookies 4 to 5 days after baking. Though chances are they won’t last that long. I only know this because I made so many batches of these cookies trying to perfect them I had tons of them. This version of the cookie I’m sharing today is the final version I made and they are just perfect. 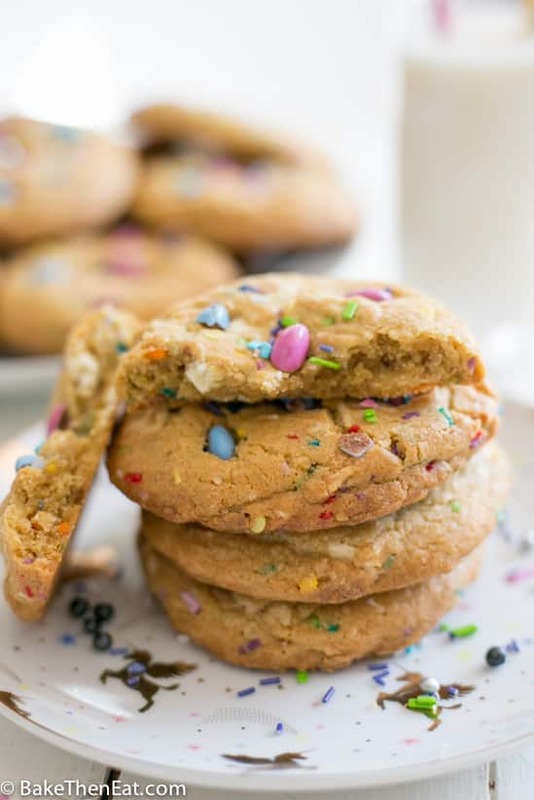 These unicorn sprinkle white chocolate chip cookies are packed full of add-ins. First, off we are using pastel coloured sprinkles, pretty and summery and enough so there are some in every bite. I then use white chocolate chunks, or chips can be used. I like chunks because I find they work better in cookies but chips are perfectly fine if you can’t be bothered to chop a white chocolate bar up. Finally, I added in some unicorn smarties, which they released for the summer season. They come in shades of pastel pink and blue. Now for my non-UK friend’s smarties are very similar to m&m’s. Small chocolate disks covered in a sugar coating. Regular smarties can easily be used or even m&m’s if smarties are not available to you. There is nothing untoward or weird in these cookies, you have your basics like flour, a touch of rising agent and a pinch of salt. I also added a few tablespoons of cornflour, many people use cornflour (cornstarch) in their cookies, it helps to keep them super soft in the middle. These cookies, unlike many of my other recipes, uses all butter for the fat. I wanted these cookies to be super rich in flavour. And unlike most of my cookie recipes, I melted the butter before I mixed it with the other ingredients. I did this for a few reasons, melted butter really helps cookies to come out of the oven a little chewie. Which I think we can all agree on is a bit of a bonus. Melted butter also negates the need for the use of an electric mixer of any sort. There is no creaming involved with these cookies, so everything can be done in one bowl with a wooden spoon. And finally, I found that the butter when melted just helps with the overall flavour. The butter seems to penetrate all the other ingredients just that little bit more when compared to the creaming method. For an even richer taste and texture, I have used an extra egg yolk along with one full egg. 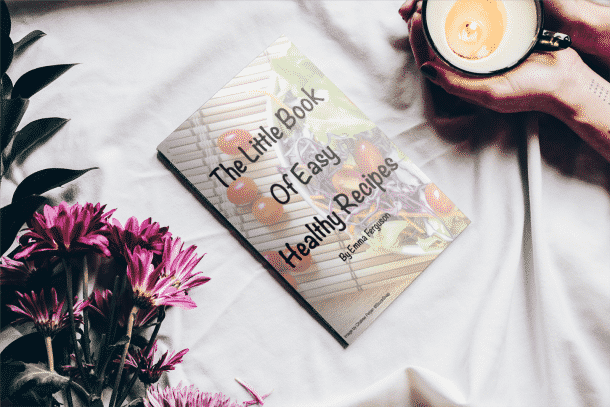 Egg yolks have a high-fat content and are great for imparting flavour and richness into cookies. Hey, I never said these cookies were a health food! There are 2 types of sugar in these cookies. White and light brown. I used light brown but you can use dark brown sugar. But then your cookies will be a lot darker. Light brown sugar helps these cookies to stay softer for longer and adds a slight caramel undertone to the flavour. It also stops these cookies from spreading too much in the oven. The small amount of white sugar in these cookies helps with the cookies spreading a little bit and ensuring crispy edges. One final note about this cookie dough, you need to allow it to chill and rest in the fridge. It’s really important that you do this. Apart from allowing the flavours to fully meld together, it will also give the dough time to rest and firm up just a little bit. The dough once mixed is quite soft so it will need this time in the fridge, and it will stop your cookies from spreading too much in the oven. 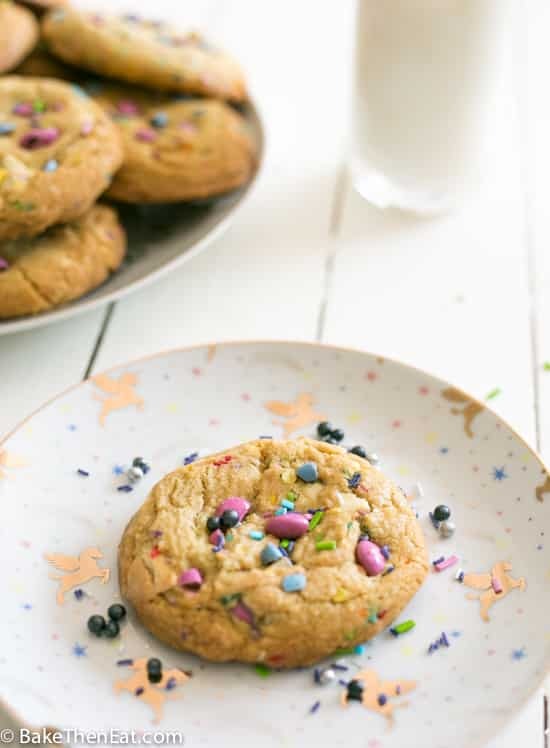 Unicorn Sprinkle White Chocolate Chip Cookies are a rich sweet cookie packed full of chocolate chunks, sprinkles and smarties. 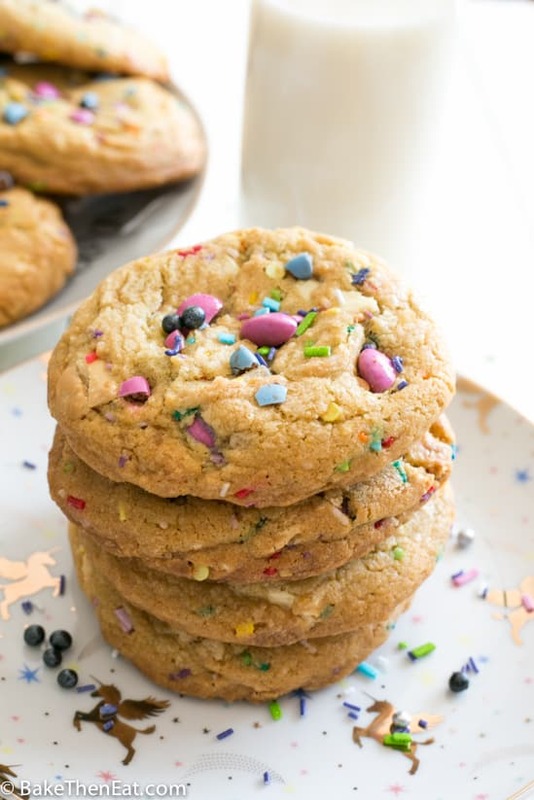 A colourful cookie perfect for a party or for an afternoon pick-me-up. In a large mixing bowl combine the flour, baking powder, baking soda and salt. Then place to one side. In a good size microwave safe jug, melt the butter on medium heat for around 60 seconds. Add the sugars, egg and egg yolk and vanilla extract into the jug along with the melted butter and mix everything together. Pour this into the mixing bowl with the flour and fold everything together. Add in the white chocolate chunks, smarties and sprinkles and gently fold them into the cookie dough. Place the dough into the fridge and leave for at least 2 hours or up to 3 days. Once you are ready to bake your cookies preheat your oven to 180C/350F/Gas mark 4. Take the cookie dough out of the fridge and allow it to sit at room temp for 10 minutes, this will make it a little easier to scoop. I used an ice cream scoop to measure out my cookie dough, using a scoop helps to keep your cookies more uniformed in shape and size. Using an ice cream scoop gives you nice big bakery style cookies. Scoop your cookies out and place them on a baking sheet with a little bit of space between each of the cookies as they do spread in the oven. I found 6 to a tray was perfect. Bake your cookies for 10-12 minutes, but no more, the secret to bakery soft cookies is to underbake them by just a touch. Once baked, take the cookies out of the oven and transfer them to a wire rack to fully cool down. If you want your cookies a little flatter then this is the perfect time to do that, just gently press down on them with the back of a metal spoon. I like my cookies thick but some like them a little thinner. 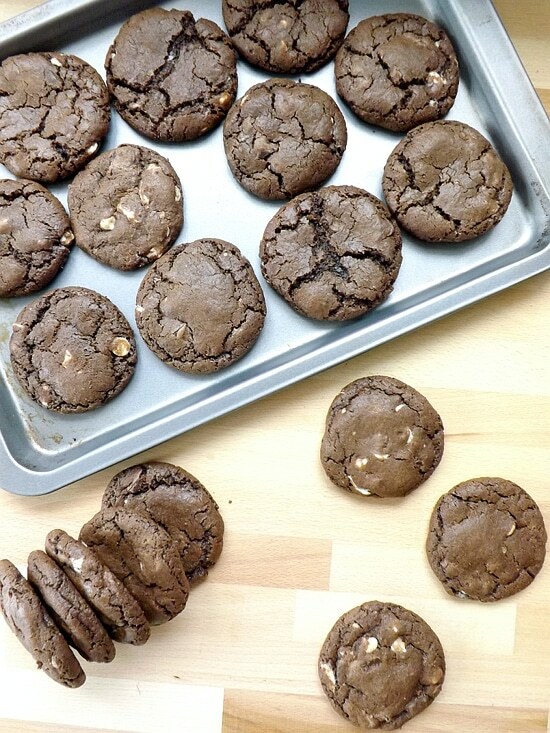 Once cool these cookies can be kept up to 5 days in an airtight tin or frozen for 2 months. 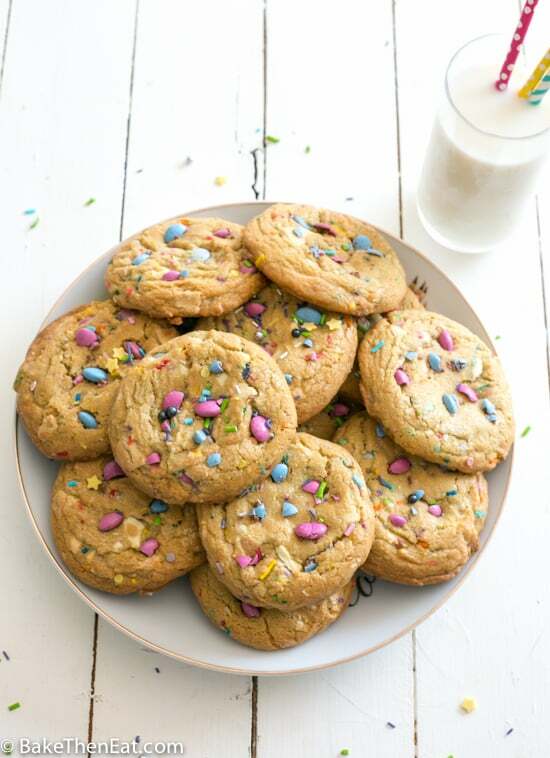 These unicorn cookies look so inviting! My husband is a huge fan of white chocolate and I am sure he is going to love these! Thank you, Angie, 😀 My hubby loves white chocolate and devoured half of these cookies! Cute! I love this whole “unicorn” trend that’s happening everywhere…everything is so colourful and bright! And chopping up your own white chocolate totally takes this recipe to the next level! 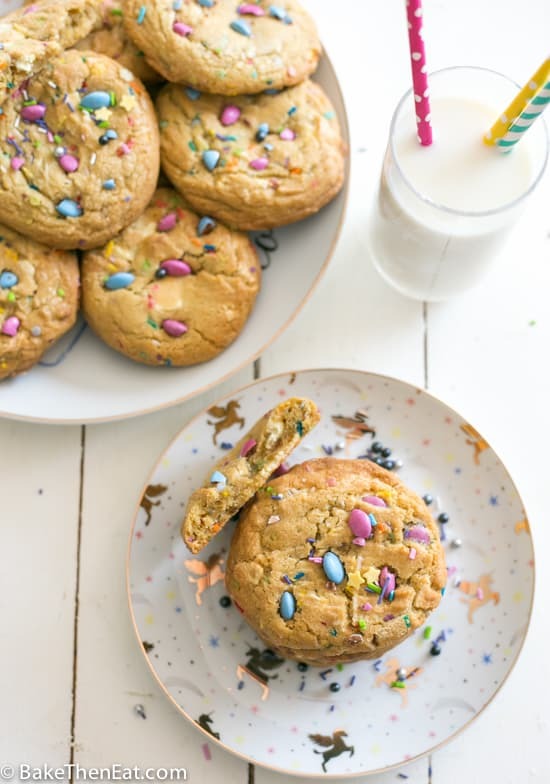 i would never have guessed you didn’t have mad cookie skills after seeing these–their texture looks just right and you can never go wrong with sprinkles! Cookies, I think, are the Best Snack Ever. Small enough so you can eat several without feeling TOO much guilt. And usually loaded with enough flavor that several are enough. Anyway, these look wonderful — super flavor and so much fun. Thanks! Thank you, John 🙂 I agree cookies are one of the best snacks ever! These are so colorful and fun, Emma! Love the bakery descriptions: slight crunch with chewy insides!